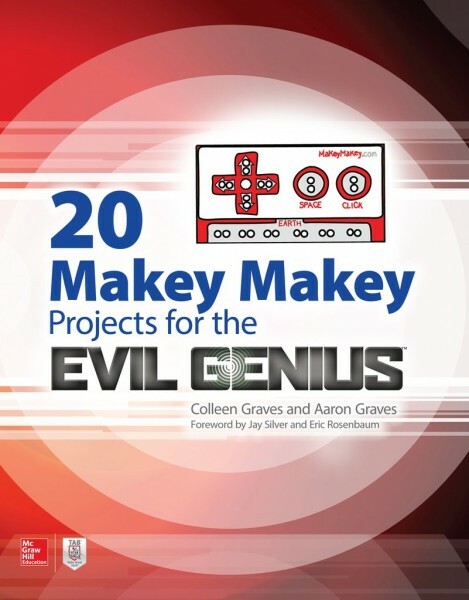 Produktinformationen "20 Makey Makey Projects for the Evil Genius"
This hands-on guide is filled with DIY projects that show readers, step-by-step, how to start creating and making cool inventions with the Makey Makey invention kit. Each project features easy-to-follow, fully-illustrated instructions and detailed photographs of the finished gadget. Readers will see how to apply these skills and start building their own Makey Makey projects. Colleen Graves is a high school librarian and blogger, obsessed with Learning Commons transformations, Makerspaces, technology education, making stuff, and getting girls involved in STEM. She offers the unique perspective of starting/creating two different makerspaces and Girl STEM groups in established public schools. Aaron Graves is a school librarian with 15 years of experience. He is a mash-up of robot geek, book lover, and tech wizard. Aaron gained his perseverance for projects through collaborative and interactive art experiences as a member of the Good/Bad Art Collective. Weiterführende Links zu "20 Makey Makey Projects for the Evil Genius"
Garantie(Jahre) "20 Makey Makey Projects for the Evil Genius"
Videos "20 Makey Makey Projects for the Evil Genius"
Kundenbewertungen für "20 Makey Makey Projects for the Evil Genius"